“STARTING today,” President Barack Obama declared in his inaugural address from the Capitol, “we must pick ourselves up, dust ourselves off, and begin again the work of remaking America.” In fact his first, urgent task is to remake finance. As Mr Obama spoke in Washington, DC, the markets in New York were sinking under the weight of failing banks despite the promise of a plan from his economic team. A day earlier Britain had put forward its second attempt to get its banks to lend. Others, such as Germany and Italy, may before long need to step in; France, Ireland and Denmark already have. The crisis has shown up flaws in financial markets and the global economy. Huge flows of capital into debtor nations like America and Britain pumped up asset markets (see article). These fed the instabilities of financial markets—which, as our special report explains in this issue, were themselves plagued by poor regulation, dangerous incentives and the reckless use of mathematical models. Fixing this will take a lot of work over the next 18 months or so, when legislation should be ready, but already a picture of a new finance is becoming clearer: smaller, better regulated, more conservative. That vision is worth keeping an eye on, but the immediate priority is the imperilled banking system. Just now, with finance in ruins, the nexus of markets and non-banks that make up the “shadow banking system” has failed. Decent businesses are being starved of credit and driven into bankruptcy. For their sake, and for the people who work for them, it is time to admit that the first round of bank rescues was not enough. With talk of huge public subsidies—nationalisation even—the question is what to do next? Nothing at all is one answer. Because last year’s efforts cost hundreds of billions of dollars, some may conclude that saving the banks is wasteful and pointless. In fact the first rescue succeeded in one important respect. The excessive lending of the boom has to be brought under control. That inevitably brutal change can take place in two ways. It could be relatively orderly as borrowers scale back and lenders strengthen their balance sheets. Or it could cause a mass-panic that would wreck banks and businesses as it did in the 1930s. Just such a panic was in the air in October. Today’s recession is grave but in sparing the banks, however undeserving, governments spared their citizens from something worse—at least so far. If a rescue makes sense, what sort? Last autumn the rescue of Britain’s banks—perhaps the sorriest in any large economy—became a template for others. Britain is in the lead once more, but this time round its effort is likely to be remembered for all the wrong reasons. The main part of the government’s new plans is to insure the banks against their worst losses on their worst assets. Nobody (not even the government) knows how much that will cost; just that Gordon Brown has once again thrown all his ideas at the problem, including the kitchen sink. The prime minister should do his bit for the building trade and order a bigger sink. The markets were unimpressed by the scale of his effort. Shares in London fell, notably in the very banks the plan was designed to help. Sterling tumbled on fears for Britain’s economy and the government’s finances. For any government setting out a rescue, this reception holds two lessons, concerning the scale and the shape of a rescue. First, its scale must surprise everyone. Because economies everywhere are suffering from excessive fear as well as over-borrowing, part of the aim is to convince investors that the downward spiral in confidence has been broken. Britain’s plans were caught in a contradiction: seeking both to save the banks, which need a staggering sum, and also to mollify voters, who (understandably) resent handing over a single penny. Scale is important in this crisis. As the recession rips through the economy, banks are bound to face further losses. Shareholders worry that these losses will continue to eat away at the banks’ reserves. Back in October governments’ promises to save the banks stabilised markets. But in this topsy-turvy crisis these promises are now pressing down on banks’ share prices. If a bank looks about to suffer large losses, investors fear nationalisation is imminent—and head for the exit. And that leads to the second broad lesson from Britain: the design of a rescue matters and history shows that it is hard to get right (see article). One possibility is government guarantees and insurance. 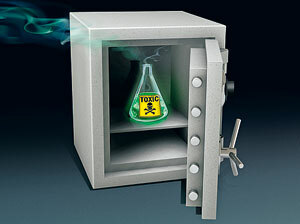 Another is to take the hit up front, by putting the toxic assets into a “bad bank” that acts as a cordon sanitaire. And a third, which has been gaining traction of late, is outright nationalisation. Each of the three has its strengths. Guarantees can quickly swing into action and the assets remain with managers who know most about them. Bad banks create a clean break that enables the good bank left behind to get on with the real job of raising capital and lending it out. Even nationalisation has something to say for it. Gone are the difficulties of valuing assets and of the bank’s shareholders plotting to grab taxpayers’ money—because the government is on both sides of the deal. Expect to hear that argument a lot more over the coming months, not just in Europe but also in America. As a capitalist newspaper, we reject a deliberate policy of wholesale nationalisation. To be sure, state ownership may make some sense as a tactic for specific financial institutions. We argued for it with both Fannie Mae and Freddie Mac in the United States and with Northern Rock in Britain long before politicians in either country succumbed to the inevitable. Like it or not, it may be the least bad option in many cases ahead. But the difficulties are legion. Unless nationalisation takes place at market prices, it undermines property rights and raises the long-term cost of capital. And even if expropriation is avoided, there are difficulties. Although nationalised banks could increase the supply of credit by restoring confidence, their record at allocating it is even worse than private banks’. If the idea is state-directed lending, the banks will waste a fortune and kill enterprise. If the plan is to offer the banks a brief shelter in a storm, it looks fanciful. Large bank privatisations are unlikely for several years. But what of the other two options—bad banks and insurance? Britain chose insurance alone and, at the moment, it looks as if it has made a mistake. The suspicion is that the government preferred insurance for political reasons because it is a promise-now, pay-later scheme. It would have done better to reach for that kitchen sink and do both—buy the worst assets at their market value and put them in a bad bank, as well as insure the healthy assets that remain against catastrophe. With a clean start, the remaining good banks would be able to raise capital. The idea would be to examine each bank on its merits, cleaning it out, partially insuring its remaining risks, and recapitalising it with government equity where necessary. At some banks that might leave the government as the biggest shareholder, as the British government is at the Royal Bank of Scotland, or the sole owner, as at Northern Rock. In such cases nationalisation is not an end in itself, but a consequence of the policy that most rapidly returns the banking system to health. It is a heavy cost, but there is no alternative. If taxpayers own a bank, pretending that they don’t only exacerbates the harm. This crisis is so huge that seeing beyond it is hard. Yet even now policymakers need to plan for the future of finance—partly to convince voters that today’s rescue is preparing for a better system; partly because finance’s shortcomings and the taxpayers’ guarantees make an overhaul of regulation necessary; and partly because sensible reforms are hard to devise. Having seen finance wreak havoc, the temptation will be to bind it in a regulatory straitjacket. Some tighter regulation is in order, especially if it is aimed at making the system more transparent. But this crisis was born of economic excess as well as financial folly; given the torrent of capital flowing into America, Britain, Spain and so on, almost any financial system would have gone wrong. Financial re-regulation is not the only reform—it may not even be the most important. Yet finance makes the rest of the economy work. Mr Obama’s prize for remaking finance will be measured in prosperity and jobs. The work should begin now.